Bob Friese, AIFD, CFD, has been inducted into the Michigan Floral Foundation’s Hall of Fame. 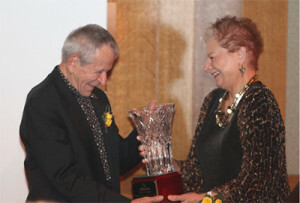 The well known floral industry figure was honored at a dinner, held at Michigan State University in East Lansing, Michigan. The event, supported by corporate sponsor Teleflora, was highlighted by “Stories of Bob” from guests and friends. For over 50 years, Friese has shared his knowledge and artistry supporting the floral industry. Active as a leader and volunteer in the American Institute of Floral Designers, he received the group’s 2014 Award of Distinguished Service and has also been honored with the Michigan Floral Association’s Lifetime Achievement Award. Early in his career, he began teaching and mentoring students at his floral school in Chicago. He took an active part in the Great Lakes Floral Expo, teaching classes at the conference and at his home studio on behalf of the Michigan Floral Association. Approximately 10 years ago Friese began hosting Nature’s Creative Edge at his property in Fruitport, Michigan. The massive floral display created by designers from around the country was open to the public and attracted thousands each year. Ticket sales benefited various organizations including local charities, AIFD National and the AIFD North Central Chapter. This year marked the finale of Nature’s Creative Edge as Friese reached his 80th birthday.